Kaiserslautern freshman Aiva Schmitz is one of several talented young players at area schools this season. 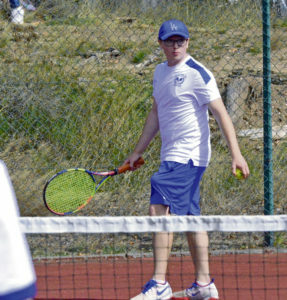 The Kaiserslautern tennis squads traveled south of the Alps last weekend to Italy and played against Vicenza and Naples in a triangular match event. The Raider girls defeated both opponents by equal 7-2 scores to remain perfect on this season, while the Raider boys’ also won twice to stay undefeated. The Lady Raiders had Aiva Schmitz, Vicky Thais Lopez and Taylor Larned each sweeping both their singles and doubles matches. Schmitz, a freshman, swept her No. 1 singles matches 6-2, 6-0 against Vicenza and 6-0, 6-0 against Naples. She teamed with Lydia Butler for doubles wins, as well. Lopez, also a freshman, did not drop a game in her two Pro Set 8 singles matches. The No. 1 doubles team of Larned and Lopez battled against tough Naples and Vicenza squads and prevailed in a championship tiebreaker against Naples, while also earning a close two-set win over Vicenza. For the boys, top KHS singles player Mark Butler swept both of his singles and doubles matches, as did No. 4 singles player junior Randy Moon. Butler won his singles matches against Naples 6-1, 6-0 and Vicenza 6-1, 6-2, while sophomores Luca Petritz and William Alsing also swept their singles matches. Olaitan Powdar and Darren Moon combined forces to win a key doubles point for the Raiders. Kaiserslautern now travels to meet SHAPE, which also has an extremely strong program. The KHS squad members are saying goodbye to PCSing team captain Lydia Butler, who besides being super strong at No. 4 singles and No. 2 doubles, has been an enthusiastic and inspirational leader for the team. 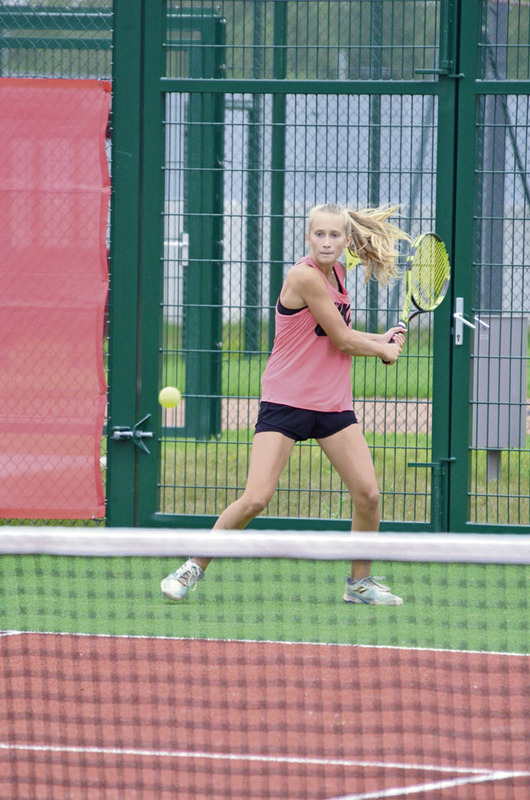 The powerful Wiesbaden girls tennis squad scored a convincing 9-0 win over host Ramstein last weekend but the Royal boys evened the score by also taking a 7-2 victory. Ramstein continues play this weekend on the road at Vilseck. Ramstein got boys’ singles wins from Jordan Leibig (8-1), Conner Sankey (8-2), Colin Kent (8-8, 7-5 tiebreak) Nick Rojas (9-7), and Danny O’Brien (8-0). Leibig and Kent scored a 6-0, 6-0 doubles win and Sankey teamed with O’Brien for another RHS victory. The Ramstein girls were competitive against WHS and won several game points, but were unable to score a match win. The closest match came at the top of the doubles lineup, where the Lady Royals duo of Alex Pinkham and Mercedez Shelton worked hard but fell 6-2, 6-3. Kaiserslautern and Ramstein competed in separate cross country meets to start the season last weekend and each found pockets of success. At a meet hosted by Vilseck, the Ramstein runners were almost able to overcome the dominance of Stuttgart, even as Stuttgart won the overall boys’ and girls’ team titles. Ramstein placed second on both sides and the schools will see each other again at a meet this weekend. Denver Dalpais was third overall in the individual standings with a time of 17:23. The winning time of 17:07 was posted by a Stuttgart runner and Royals’ coaches said several RHS athletes missed the meet with the flu. “We will travel again this week and it will give everyone a new chance to compete,” said RHS head coach Allen Correa. Ramstein also had Conner Mackie (17:42) in fourth place overall, Jacob Heath in seventh, Benjamin Brewster in ninth, and Ezra Letz in 11th. The course was slow overall and athletes from several schools were running in their first-ever 5K race. The girls’ competition was also won by a Stuttgart runner at 19:13, but Ramstein’s Jordanne Hill (21:01) came in fourth and Annika Zimmerer (21:03) was fifth. Kristin Lucero was seventh, Sophia Pak was 10th, Alexis Pierre-Louise was 13th, and Haley Deome was 15th to round out the Lady Royals’ best finishers. Kaiserslautern and Baumholder were both part of a large meet on Rhine Ordnance Barracks, where the Raiders took first place on the boys side and second with the girls. Baumholder’s boys were third overall and the Lady Buccaneers were fourth. Chloe Martin of Kaiserslautern posted a time of 19:25 as the top competitor from area schools while Piper Parsells took seventh place. Joseph Purvis of KHS had a time of 17:02 for second place in the boys’ race, with teammates Orlando and Yadiel Rojas also finishing under 17:25 for third and fourth place, respectively. Griffen Parsells (17:30) was fifth and Ethan Cooper (18:10) was seventh to fuel the Raiders’ team title. A golf event at Woodlawn course last week saw big performances from several Ramstein players. 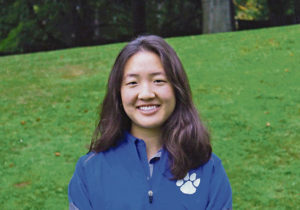 Phoebe Shin kicked off her season by scoring 33 points in the scoring format to win the overall girls’ competition. Ramstein also had Lauren Sutherland (26) and Harley Parks (22) in second and third places, respectively. Wiesbaden and Ramstein had multiple players jousting for overall supremacy on the boys’ side, with Ben Todman of RHS finally taking top prize. Wiesbaden edged the Royals for the boys’ team trophy but the Lady Royals won the girls’ overall title. Todman (39) outlasted Wiesbaden’s Bryan Cortese (38) for the individual boys’ win. Also placing best in the final standings were Wiesbaden’s Jonah Galvan and Nicholas Burnett, plus Ramstein’s Micha Webb and Kaiserslautern’s George Stephen. In a joint meet last weekend, Ramstein and Kaiserslautern both competed against Vicenza and Naples. The opener gave all four schools a chance to test themselves and Ramstein came away as the most accomplished of the group. Ramstein defeated Vicenza 25-15, 25-23, 15-25, 18-25, 15-6 after sweeping the first two games, losing the next two, then winning the fifth one. The Royals also defeated Naples in straight games 25-18, 25-19, 25-13. Kaiserslautern made some big plays at times but fell to both Vicenza and Naples. The Lady Raiders will join the Lady Royals and Lakenheath in another joint meet this weekend hosted by Wiesbaden. The Baumholder Lady Bucs started off at a joint meet and dropped matches to Sigonella, Brussels, and Ansbach. Each of the matches featured high scores but the BHS team was unable to register its first win. Baumholder will see Ansbach again this weekend. A three-team match is set to take place on the Baumholder campus as BHS, Ansbach and Hohenfels will take turns competing.